How random are you? Or let me be precise, how random is your behaviour at times? I am sure we all (me included in capital letters) behave randomly at times. At times, to be honest I behave extremely randomly. Sometimes it is big, sometimes not so. Like I plan my life one way and then ditch it all and go off to do something completely different. I know it is a bit of a whopper. Mostly I am not that random. Mostly it is small things like I start to say one thing and then end up saying else. Or I start planning one meal and then cook something altogether different. If at this point you are nodding your head in solidarity, cheerio my friend! Let the random souls of the world unite and shake hands or exchange recipes or just say hi. For this month's Blog Hop Wednesday my usual randomness has been in full force. I am paired with the sisters Harini and Jaya of Tamalapaku. Now when I first checked out their blog, I loved the watermelon drink they had made. Since summer was knocking, I decided that we must have that drink. Then it started to rain in London and it got cold again, so summer drink seemed wee bit inappropriate. Since my husband's graduation was right after the Queen's Jubilee celebrations, I thought their microwave cupcake would be ideal. Also the fact that it is super quick to make added to the attraction. Right now I am BUSY. My in-laws are visiting and I am rushed off my feet. Literally. Then today, being already two days late, when I sat down to copy the recipe, I chanced upon another--their recipe of Pineapple Kesari. Now this is something I have been planning to make for sometime, I have got an old recipe of Sanjeev Kapoor's bookmarked for the last couple of years. Also a pineapple has been languishing in my fruit basket for sometime, I am sure feeling sorry for itself while its other fruity friends got devoured and it got left behind. So I decided to use the pineapple and make some halwa. I know pineapple halwa is the last dessert one expects while looking at photos of Oxford. You would expect some scones, or Victoria sponge, or at least some fairy cakes. But instead I have some halwa. Talk about being random. 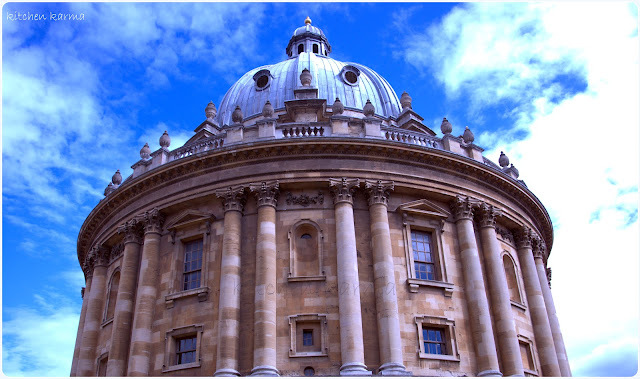 Okay, I know I have been rambling for sometime, let me shut up and share some photos of Oxford and of course the recipe. The famous Radcliffe Camera of Oxford. You can read more about this library of the University of Oxford here. Cycle stand in city centre. 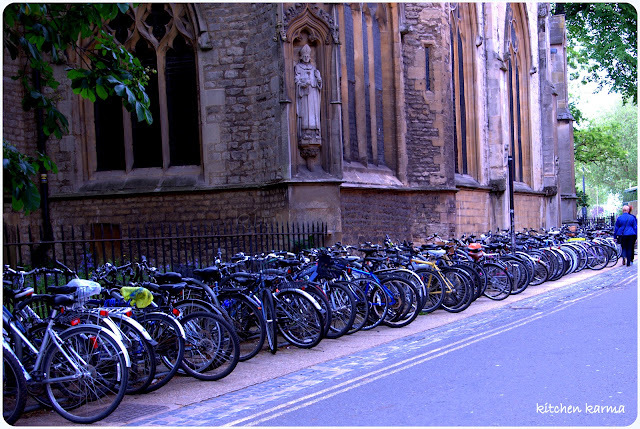 Now Oxford for me would never be complete without its numerous bicycles. Most of our friends who bought cycle in Oxford at the beginning of their term, had their stolen. So whenever students gathered they would invariably discuss cycles! 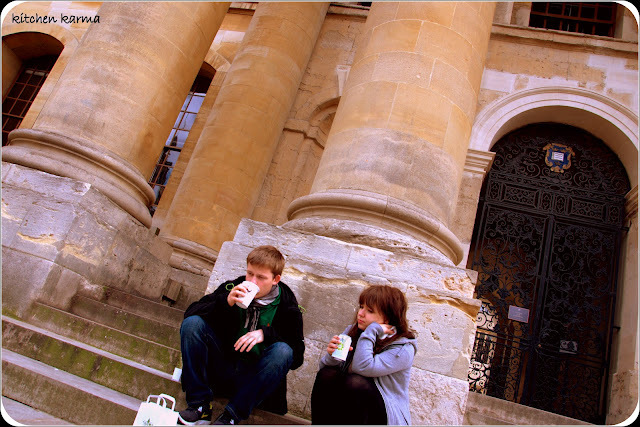 How could a photo album of Oxford be complete without students? 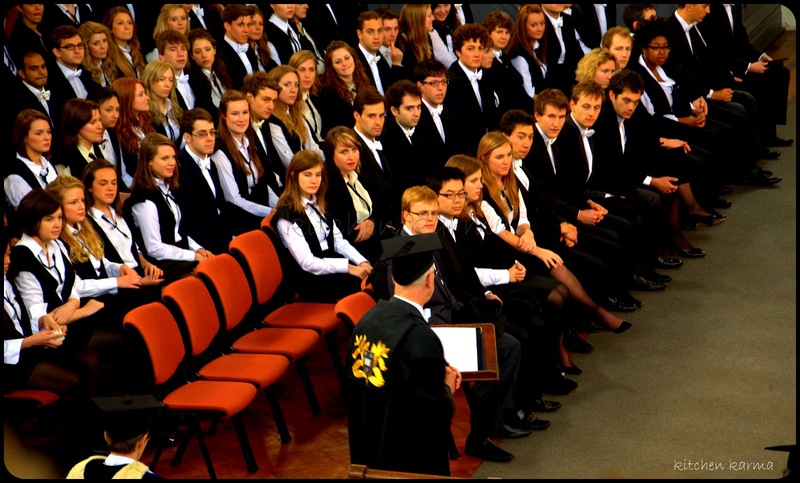 Vice Chancellor giving graduation speech! The ceremony was solemn and traditional, some of it in Latin and most of the medieval customs still followed today! This was the dessert served during the college lunch. Frankly the food was nothing to write home about. Now onto the pineapple halwa/kesari. I followed recipe step by step, the milk did curdle like warned, but it not much affect the taste of the finished product. Maybe next time I will try it with water. You can find the recipe here. In a heavy bottomed, non stick pan dry roast the sooji until it turns golden brown in colour and becomes aromatic. Set it aside and let it cool down. Soak the saffron strands in a teaspoon of milk and set aside. When the pineapple is cooked well enough, slowly sprinkle the roasted sooji while mixing well so there are no lumps formed. Add the saffron strands soaked in milk. 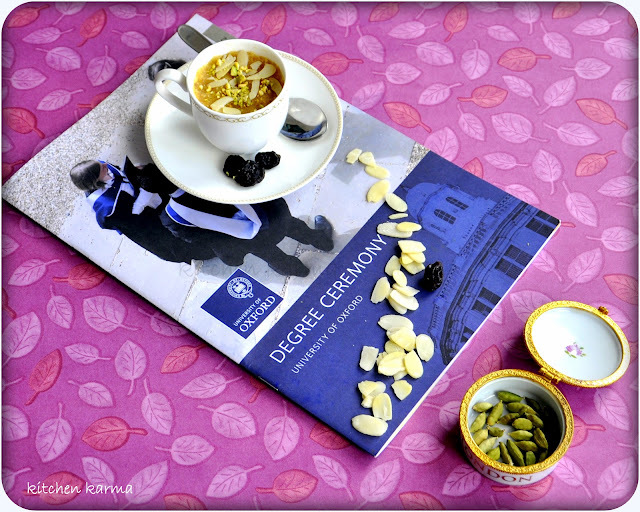 nice being random...congrats on the hubby's graduation.........really nice pineapple kesari. Hi Suchi, how are you? Thanks for sharing all the lovely photos, your halwa sure look interesting. Love your presentation. beautiful yummy treats. They look lovely! Congratulations & the pineapple kesari looks & sounds so interesting.......will have to try it now. Congrats on the great occasion. you must be very happy. love the clicks of the event and around the place. Hey Suchi, it happens with me too... I plan on cooking one thing and end up whipping something altogether different... pineapple kesari looks awesome! Pineapple kesari really sounds yummy. 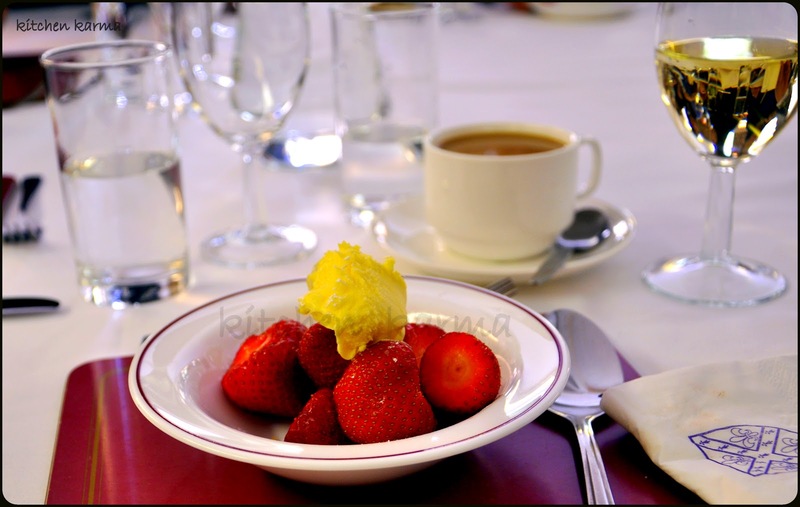 I'm wondering what was the dessert at the college lunch.....looks like a tiny scoop of ice cream atop some strawberries to me. Congratulations! ( to both of you) - and nice way to present kesari - will keep in mind! Nice way to celebrate the graduation, looks superb..
Wow such gorgeous pictures! It is funny how we all are random at different times in different circumstances :) It was nice being paired with you. Congrats on your hubby's graduation,these pineapple kasari sound really yummy,I never had one ,interesting dish !! lovely pics dear..thx for ur comments in blog...! 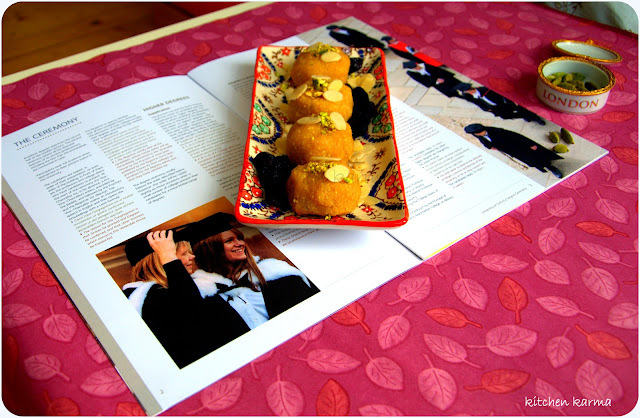 !glad to knoe ur frm london too!...kesari looks delicious n tempting..following u! great photos! and the pineapple kesaris sound DELICIOUS! yummy and super delicious halwa.you have a nice blog.you can visit my blog and give ur valuable comments. Lovely blog...happy to follow u..
Those are some wonderful pics. You sure have a lovely space suchi. am your new follower now. So tempting... looks awesome! All your food pictures are mouthwatering! What camera do you use? Congrats dear for the great occasion!lovely recipe to celebrate...loved your post and great pics!! Your pictures are gorgeous! Everything looks great. Lindas fotos y buena receta,abrazos hugs,hugs. We make halva in Greece too! This with pineapple is a perfect idea especially now that summer is upon us! always love going through your posts dear !!!! !the pineapple kesaris look absolutely delicious !!!! !lovely pics !!!!!! Look at those bikes! Beautiful recipe, as usual. I have been looking for something to do with the pineapples on my bench. This could be the one! 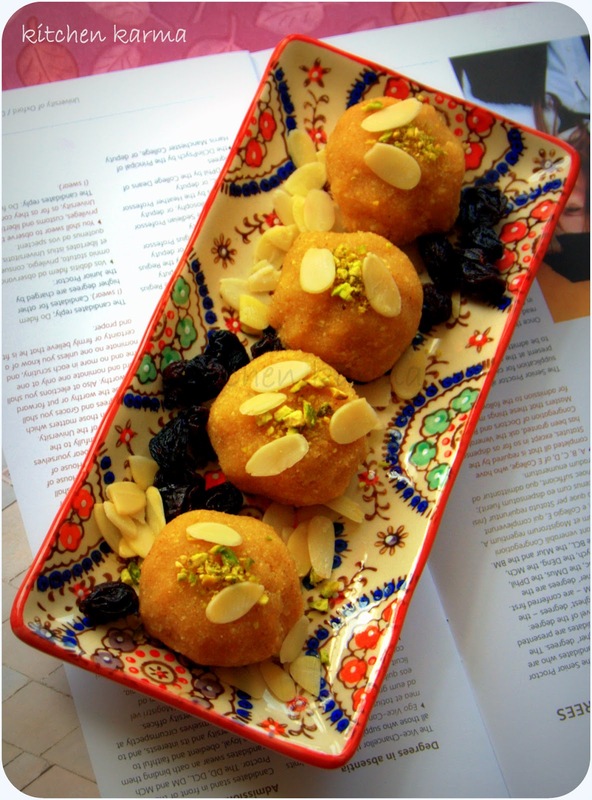 the recipe looks lovely and delicious...mouthwatering snaps!